Gravity waves (GWs) are a ubiquitous phenomenon in a stably stratified atmosphere. GWs are excited by flow over orography and by convection or jet streams and fronts, and may propagate both horizontally and vertically over large distances. Thus, they lead to a significant vertical and horizontal transport of energy and momentum which so far is hardly appropriately accounted for in numerical weather prediction and climate models, which mainly rely on simplified parametrization schemes. In order to investigate sources, propagation, dissipation and impact of GWs, a number of large internationally coordinated research campaigns have been conducted over the past few years. These campaigns involve observations with research aircraft, satellites, research balloons, and ground-based instruments, as well as related modelling efforts. Specifically, these are the series of GW-LCYCLE (Gravity Wave Life CYCLE) campaigns conducted in northern Scandinavia in winter 2013 and 2015/16 as well as the NSF-DEEPWAVE (The DEEP PROPAGATING GRAVITY WAVE EXPERIMENT) campaign conducted in June/July 2014 from New Zealand. The German contributions to these activities were funded in the scope of the ROMIC (Role of the Middle atmosphere in Climate) research focus of the German Ministry for Education and Research as well as the MS-GWAVES (Multi Scale dynamics of Gravity WAVES) research unit funded by the German Science Foundation. For this special issue, we invite contributions describing observations and related modelling studies focusing on results achieved during these field campaigns. However, beyond studies specifically addressing results obtained in the framework of GW-LCYCLE and DEEPWAVE, we also invite any related studies dealing with GW processes and their impact on the atmosphere. Within this framework, contributions focusing on both scientific and methodological aspects will be considered. 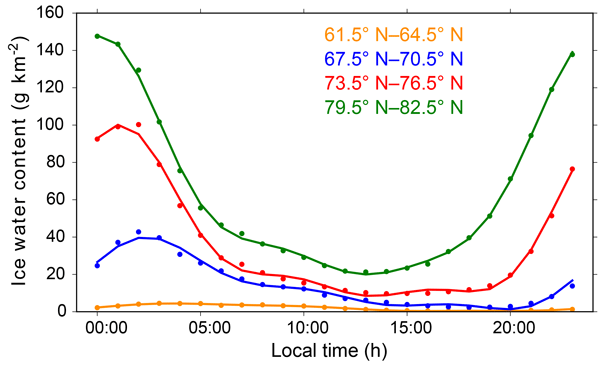 Atmospheric measurements on rising balloons can be compromised by the balloon's wake. The aim of this study is to provide a tool for assessing the likelihood of encountering the balloon's wake at the position of the gondola. 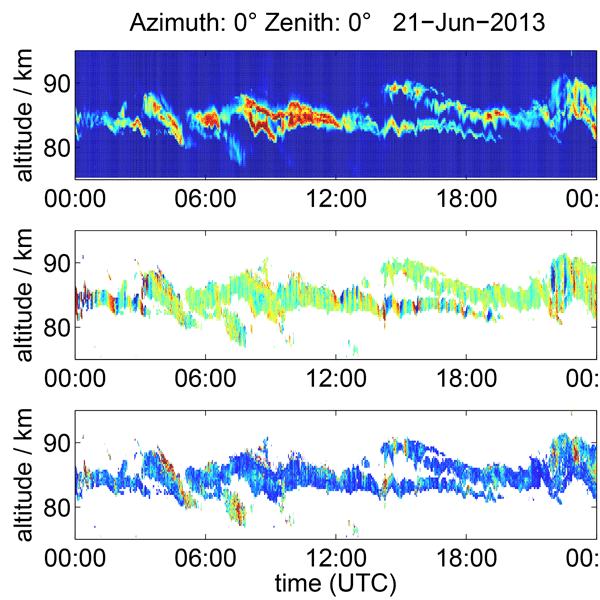 This includes an uncertainty analysis of the calculation and a retrieval of vertical winds. We find an average wake encounter probability of 28 % for a standard radiosonde. Additionally, we evaluate the influence of wake from smaller objects on turbulence measurements. Simultaneous temperature measurements during the WADIS-2 rocket campaign are used to investigate the thermal structure of the mesopause region. Vertically and horizontally resolved in situ and remote measurements are in good agreement and show dominating long-term and large-scale waves with periods of 24 h and higher tidal harmonics. Only a few gravity waves with periods shorter than 6 h and small amplitudes are there. In winter 2016, the camera system FAIM derived information about the OH* airglow at ca. 86 km height during six flights on board the research aircraft FALCON in Northern Scandinavia. Coincident ground- and satellite-based measurements (GRIPS and TIMED-SABER) complete the data set. 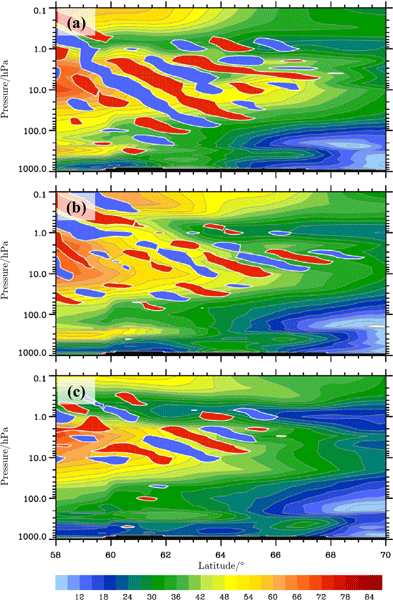 The data are analysed with respect to the temporal and spatial evolution of small-scale atmospheric dynamics just before a minor stratospheric warming. Special emphasize is put on instability features. GLORIA observations during two crossings of the polar front jet stream resolve the fine mesoscale structure of a tropopause fold in high detail. Tracer–tracer correlations of H2O and O3 are presented as a function of potential temperature and reveal an active mixing region. 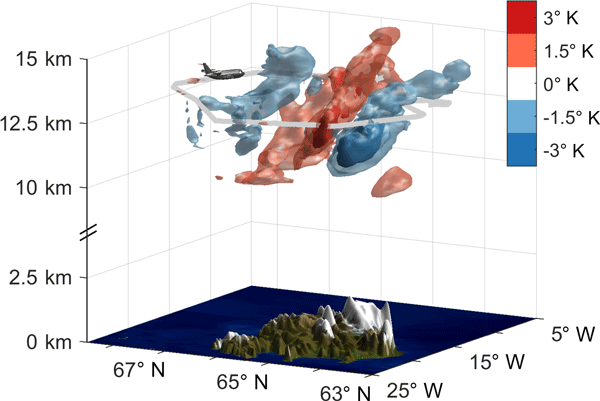 Our study confirms conceptual models of tropopause folds, validates the high quality of ECMWF IFS forecasts, and suggests that mountain waves are capable of modulating exchange processes in the vicinity of tropopause folds. 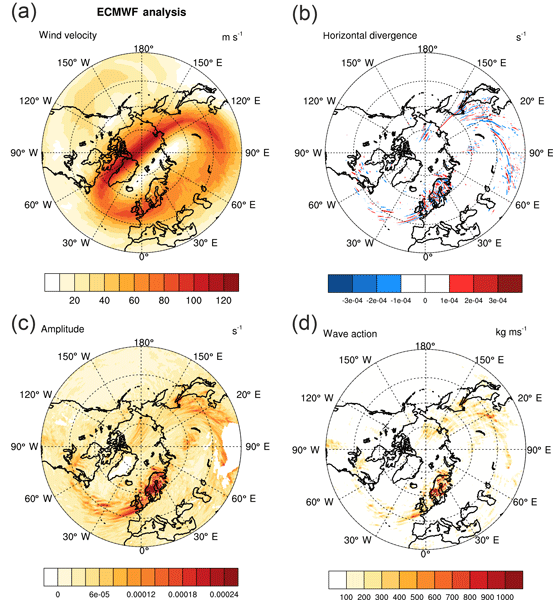 A deep upper-air sounding stimulated the current investigation of internal gravity waves excited during a minor sudden stratospheric warming (SSW) in the Arctic winter 2015/16. 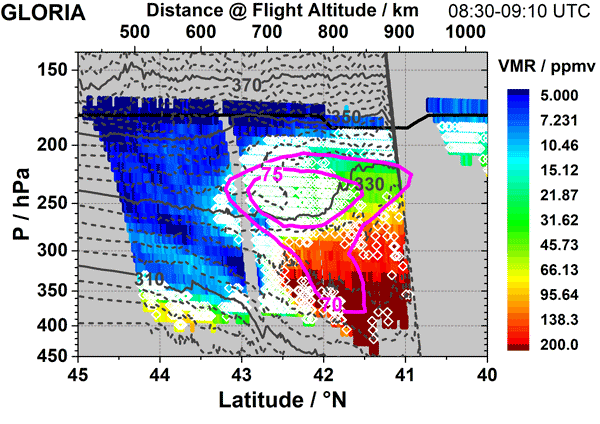 The analysis of the radiosonde profile revealed large kinetic and potential energies in the upper stratosphere without any simultaneous enhancement of upper tropospheric and lower stratospheric values. In combination with high-resolution meteorological analyses we identified an elevated source of gravity wave excitation. Three-dimensional temperature measurements of the atmosphere are required to address current research questions concerning the propagation of gravity waves. Limited angle tomography (LAT) with measurements from an airborne infrared limb imager can provide such 3-D temperature measurements. Wave parameters derived from such LAT measurements achieve an accuracy similar to that derived from full angle tomography, if the orientation of the flight path is optimized with respect to the gravity wave. 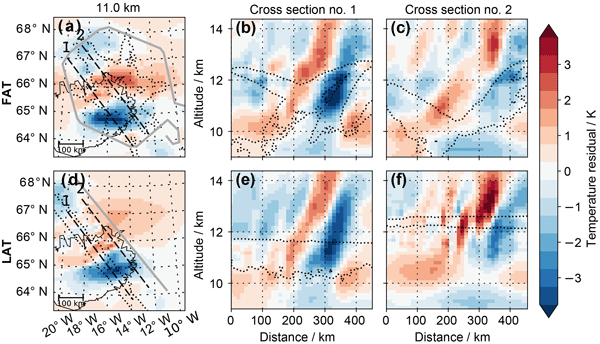 Local time variations of polar mesospheric clouds (PMCs) in the Northern Hemisphere are studied using a combination of a global circulation model and a microphysical model. We investigate the brightness, altitude, and occurrence of the clouds and find a good agreement between model and observations. The variations are caused by tidal structures in background parameters. The temperature varies by about 2 K and water vapor by about 3 ppmv at the altitude of ice particle sublimation near 81.5 km. Different kinds of waves are the subject of intense research because they are suspected to steer several different atmospheric phenomena. To analyse the effects of waves, wave packet characteristics have to be known. We introduce a new tool to study wave packets locally: Unified Wave Diagnostics (UWaDi). 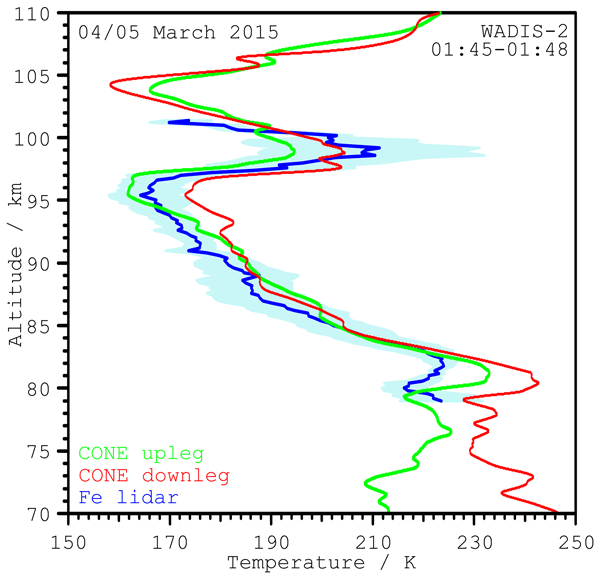 To show the advantages of UWaDi, a sudden stratospheric warming period in 2016 is analysed for different background wind conditions, revealing gravity waves emitted from a jet exit region. The aim of this study is to find the origin of mesospheric stationary planetary wave (SPW) in the subtropics and in mid and polar latitudes in mid winter 2015/2016. 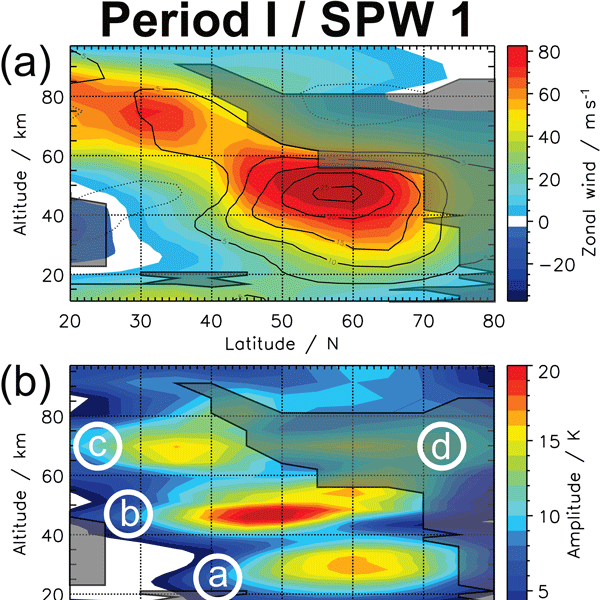 Our results based on observations show that upward propagating SPW and in situ generated SPWs by longitudinally variable gravity wave drag and by instabilities can be responsible for the occurrence of mesospheric SPWs and that they can act at the same time, which confirms earlier model studies. Temperature profiles from operational weather satellites are used to determine the global distribution of gravity wave activity. This is an important information to constrain global climate models. The quality of this data set is assessed by systematic comparison to model fields from ECMWF which are considered very high quality. This reveals good agreement between model and observations, albeit the model misses localized centers of wave activity if model resolution is too low. Gravity waves (GWs) as well as solar tides are a key driving mechanism for the circulation in the Earth's atmosphere. The temporal variation of these waves is studied using a record long 10-day continuous Rayleigh–Mie–Raman lidar sounding at midlatitudes. This data set shows a large variability of these waves on timescales of a few days and therefore provides new insights into wave intermittency phenomena, which can help to improve model simulations. 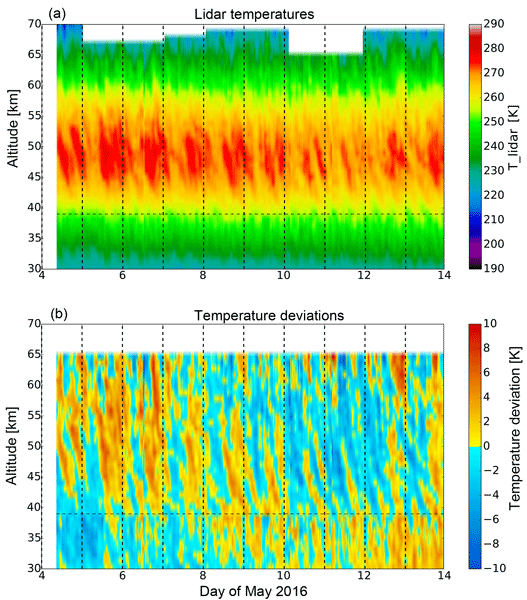 Using the infrared limb imager GLORIA, the 3-D structure of mesoscale gravity waves in the lower stratosphere was measured for the first time, allowing for a complete 3-D characterization of the waves. This enables the precise determination of the sources of the waves in the mountain regions of Iceland with backward ray tracing. Forward ray tracing shows oblique propagation, an effect generally neglected in global atmospheric models.